Being healthy isn’t just about accumulating data—it’s about what you do with it. Like most guys these days who enjoy keeping round-the-clock tabs on their fitness levels, you probably know the unique pleasure of getting that late-in-the-afternoon wrist-tracker or smartphone message: Goal achieved! You’ve walked 10,000 steps. Great job! Though hardly the same level of satisfaction that follows a good four-miler or an hour with the free weights, it’s nevertheless a nice little confidence boost. But considering the pace at which technology is advancing, haven’t you also found yourself wondering why all these cutting-edge digital tools can’t do just a little more than count calories, steps taken, and heartbeats per minute? Say, beam a doctor into your living room in an emergency? Let your smartphone double as a nutritionist, therapist, or even medical specialist—or, better yet, all three? Well, get ready for some good news, because that’s all I’ve got for you from here on in. THERE ARE WAYS TO AVOID THE DOCTOR’S OFFICE. Recently, my wife had a chest rash we were concerned about but didn’t consider at all life threatening. So instead of embarking on an expensive and time-consuming trip to the ER, I fired up a new app—Doctor on Demand—and paid $40 to get her a 15-minute consultation with a nearby physician. It was amazingly easy: Through a FaceTime-like interaction, the doctor took a look at the rash and diagnosed it as ringworm, and had a prescription automatically sent to my local pharmacy. In fact, with its 1,400 doctors available 24/7, Doctor on Demand is an excellent way to treat many simple infirmities, such as muscle sprains, sports injuries, sore throats, and flu symptoms. If you don’t feel like beaming the doctor into the room live, you can text, too. 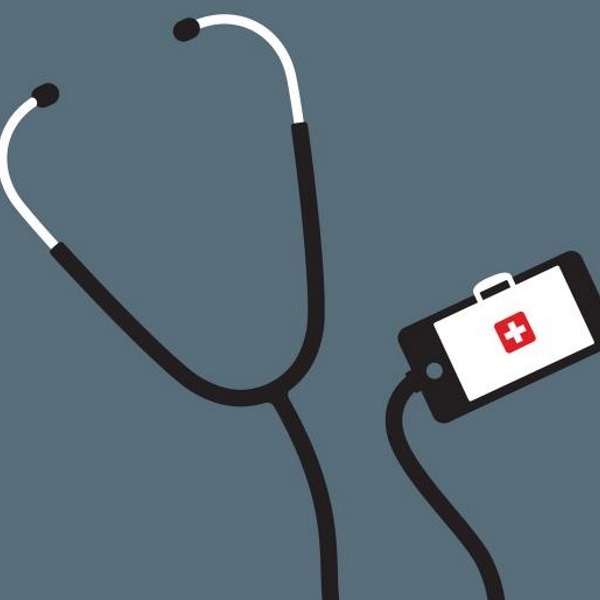 Just download HealthTap, an app founded at Stanford that connects you with real doctors for free. And don’t worry: There are 73,000 doctors on the company’s roster, so someone will get back to you fast. You can even take it to the next level and share photos or test results, and pay a small fee (starting at $19.99) to get an answer, more insight into a condition, or just a second opinion. Obviously I wouldn’t advise using HealthTap for severe chest pains—but you get the idea. And if you really want to avoid your regular checkup, consider making a bigger investment: Smart, new, easy-to-use blood pressure and heart-health monitors from companies like iHealth (starting at $80) and MocaCare ($149, see page 28 for our report) bring the doctor’s office home. iHealth also has a $70 Wireless Pulse Oximeter to track your blood oxygen saturation and, for diabetes sufferers, a $30 glucometer that reads your test strips and records blood sugar levels. If you’re dealing with a skin condition like acne, eczema, cold sores, or insect bites, you won’t necessarily get what you need from Doctor on Demand or HealthTap, since you’ll need to talk to a specialist. Instead of waiting to get a referral from your doctor, log on to the new app Spruce, which connects you with a board-certified dermatologist for just $40. Rather than sit in a dreary waiting room, you just fill out a quick survey on your phone, use your smartphone to take a few well-lit pictures of the affected area, and within 24 hours you’ll have a prescription and a personalized treatment plan delivered straight to your device. And if that doesn’t completely answer your concerns, you can ask follow-up questions for 30 days following the initial interaction. Next step? For iPhone users, check out Addapp, a service that looks at data from all your apps and fitness devices and gives you actionable insight such as how your activity levels and sleep quality are related, and whether your activity levels correlate to the food you’re eating. It also connects you with apps like Uber and Foursquare’s Swarm, and alerts you when it sees correlations between, for example, periods of time when you’re eating out a lot but falling of your running routine, or taking more Uber rides that could be affecting your mood or weight. Because Addapp analyzes the data in real time, when it spots unhealthy trends it can quickly notify you and offer suggestions—before you start to get out of your fitness routines. If you’re on Android, check out WebMD’s Healthy Target app. Basically, you enter your health goals, then Healthy Target looks at all your data and provides customized insights and recommendations. Each week you’ll get a review that will show you where you succeeded and where you could do better, plus actionable tips to help you improve your health the next week, before you’re reviewed again. In other words, it doesn’t just accumulate data, it tells you what to do with it. GET YOUR OWN PERSONAL NUTRITIONIST. Nothing helps you lose weight like a for-hire expert. For as little as $50 a month, the Rise app gives you on-demand access to a registered dietitian who evaluates your meals and offers you feedback about your diet. The app’s super simple to use—just take pictures of your food and share notes about your exercise, and in a matter of minutes your coach will come back with problem spots and challenges; he or she will even join you for some celebration when you hit your health goals. Simply tracking your meals is another great, easy way to keep yourself honest and make sure you hit your calorie goals each and every day. I love Under Armour’s MyFitnessPal app, a free calorie counter and diet tracker. What makes it stand out is its massive built-in database of more than 5 million food items. For instance, search for “Grande Soy Caramel Macchiato” and, no joke, the Starbucks drink pops right up—240 calories. And you get not just an accurate count of your day’s calories and complete macros but also the ability to sync that data with more than 30 other apps and devices, like Addapp or the Withing’s Smart Body Analyzer, a scale that transmits your weight wirelessly so you’ ll never lose track. AND, IN AN EMERGENCY, STOP YOURSELF FROM GOING ON A RAMPAGE. After a tough meeting, I need a minute to get my head back in the right space. For that, I turn to Calm (calm.com), an app for desktop, tablet, or smartphone. Unlike the dozens of other meditation apps out there, Calm cuts through the clutter precisely because there’s no account to set up or community to join—you simply launch it and start a meditation session within seconds. Out of all the meditation apps I’ve tested (too many to count! ), Calm has the best curriculum of guided meditations that manage to be both deep yet easy to implement into your life. Start with its free “7 Days of Calm” course, which walks you through the basics of mindfulness, deepening your concentration and focusing on your patience. From there, you can pull up the app whenever you need it, at your desk, during your lunch break, and do a session as short as two minutes. Once you’re logging 30-minute sessions, not even leaving your smartphone at home will throw you into a panic.